The design, which will be incorporated in the world’s largest commercial planemaker’s Model 777-8 and 777-9 models, would allow the bigger wings to fit into the standard-sized airport parking space. The concept is so new and commercial aircraft design standards didn’t anticipate the product, US regulators had to come up with a new set, according to Bloomberg. On Friday, the Federal Aviation Administration approved those special conditions for the foldable wings. The feature will help reduce the wingspan to 212 feet from 235 feet when folded during ground operations. Twin-engine, long-haul aircraft seating around 350 to 410 passengers is seen as the industry’s next big battle with both Boeing and rival Airbus competing for a potential market of several thousand. Once the new planes touch down, the tips of the wings will rotate until they’re pointed skyward, which will make it the only commercial jet in widespread use with such a hinged design. A set of locking mechanisms will make it impossible for them to retract while airborne, according to the company. A new CFRP wing would be 213 or 225 ft; 2,560 or 2,700 in (65 or 68.6 m) wide with blended winglets, or up to 233 ft 5 in (71.1 m) with raked wingtip for a 10% larger wing area. 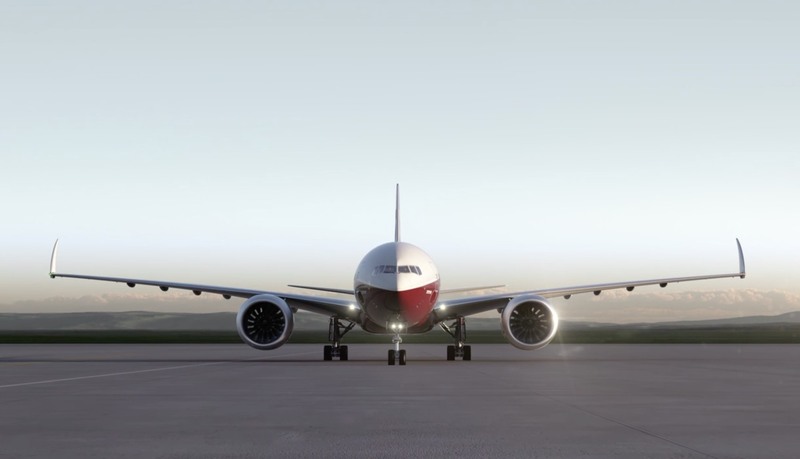 It would fall into ICAO aerodrome code F like the 747-8 and A380 but with 22 ft 6 in (6.9 m) folding wingtips it would stay within the 213 ft 4 in (65 m) code E like current 777s. Horizontal stabilisers would be extended.